Keith Carey Memorial Shield 2013. Sunday 21st September marked the day we chose to remember and honour our former chairman Keith Carey using the donated shield for the club to vote for its favourite model boat within the club. With over a quarter of the club membership in attendance the day was fantastic with plenty of model boats to see, everything from warships and tugs, to yachts and cabin cruisers. The membership were asked to choose their three favourite models and cast a secret ballot and with 19 models to choose from it was certainly a challenge! The voting started at 11am and finished at 12pm with a good and healthy competition amongst the competitors but it was also a day for a relaxing sail with Tony Newstead showing his latest model of an armoured cruiser called IJN Kasuga whilst Alan Burgess showed his quirky model called ‘Skelton Crew’. The largest model sailing was Ron and Sheila Kingdom’s majestic HMS Rodney Royal Navy battleship in its amazing camouflage scheme. 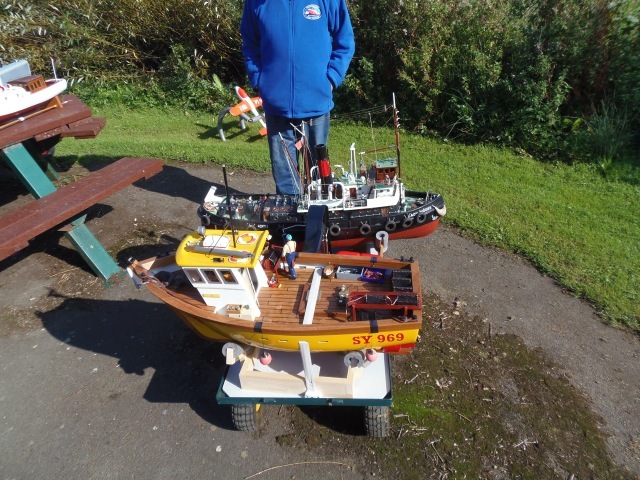 Paul Millers showed his Lady Wooes tug with his new fun fishing trawler called ‘Gratitude’- just look for some of the funny little things that this fishing boat has fetched up! Bob Baker displayed his air boat with a speaking action man, Brian Inger brought along his ‘Topaz’ yacht, and Mick Shambrook had his infamous surfer girl, a new life boat and a lovely motor yacht called ‘Amber’. Defending shield holder, Nigel Marriott, displayed his latest model of the water-jet powered yacht, ‘Moonraker’. As has become the custom Maureen baked a lovely chocolate cake and some chocky-caramel biscuits which went down very well with all the members. The results of the competition will be announced and the winners awarded at the club’s Christmas Dinner, we are all looking forward to the result and I will be keeping the secret until the dinner-so no sneak previews!!! See you at the dinner with the results!